In a large bowl mix together vinegar, soy sauce, salt, mustard powder, black pepper, and sugar. Marinate the chicken in the mixture for as long as possible. 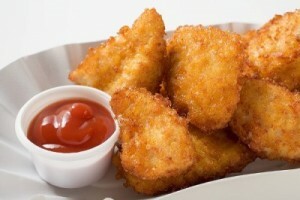 Dip the chicken in eggs then bread crumbs and fry until golden brown.